It comfortably fits up to 6 and is centrally located on a quiet green square with many shops and restaurants around and quick access to subway and tram or 20 minutes walk to the Old Town. If you are looking for true local experience in nice, safe and lively neighborhood with quick and easy access to all popular sites then this is YOUR place! We will do our utmost for you to be delighted! The apartment is modern and fully equipped with everything you need including dishwasher, washer/dryer, smart TV with internet access and NETFLIX subscription, hifi system with any mp3 player connection, espresso coffee maker, hairdryer and much more for either short or long stay for pleasure or business. Bedroom has comfortable King size bed with quality mattress, pullout sofa bed for two and wardrobe to store your clothes. The second room serves as living room and lounge area. It can be converted into the second bedroom as it has another sofa pullout bed where two more can sleep. Kitchen is in separated room and has dining table for up to 6 people. It is FULLY equipped with all necessary appliances - refrigerator, freezer, dishwasher, washer and dryer, glass ceramic cooktop, multifunction microwave oven, toaster, kettle and espresso maker for coffee lovers like me. There is also full set of utensils, glasses, knifes, pots, pans and rags. Fresh coffee, tea, salt, pepper, sugar, dishwasher tablets, detergents and more are provided. The bathroom is combined with toilet and has walk in rain shower. Hair dryer, soap, shower gel, shampoo, towels, toilet paper - all be ready for you. It is ideal for small groups or families and can easily accommodate 6 people. There is small iron and ironing board if needed. There is central heating system in the building but each apartment controls its own temperature. The most popular central Prague residential district with Art Nouveau and Art Deco buildings, loads of cafes, restaurants, bars, clubs, shops, farmers market and also green parks while just step away from the tourist crowds (and traps). Famous Riegrovy sady garden (with amazing views on Prague castle and summer outdoor pubs) is 10 minutes walk away and Parukářka park (also cool viewpoint) is 5 minutes. Žižkov Tower with viewing platform and the best views of Prague on a sunny days is just around the corner and all the main tourist attractions (Charles Bridge, National Theatre, Wenceslas Square, Old Town Square, Prague Castle, Lesser Town Square etc.) are short tram or metro ride or walkable if you enjoy walking. The apartment is 3 minutes from nearest tram stop that brings you to Wenceslas square in about 7 minutes. It is also minutes away from Jiřího z Poděbrad square (metro station) with Farmer's Market or Flora (metro station) with shopping mall and cinemas. Most of the touristic highlights are less than 10 minutes by public transport. Walking to Wenceslas square takes about 25 minutes then 10 minutes to Oldtown square and Charles bridge is another 10 minutes walk away. Main train station (Hlavní nádraží) is less than 5 minutes by tram and airport is less than 1 hour by public transport (30 mins by taxi or we can arrange our driver for very reasonable price). PARKING - Free street parking approx. 10 minutes walk from the apartment and parking garage is 500 meters from the apartment. From 9 EUR/day, reservation required. The earlier you book, the cheaper you park. The most popular central Prague residential district with Art Nouveau and Art Deco buildings, loads of cafes, restaurants, bars, clubs, shops, farmers market and also green parks while just step away from the tourist crowds and traps. 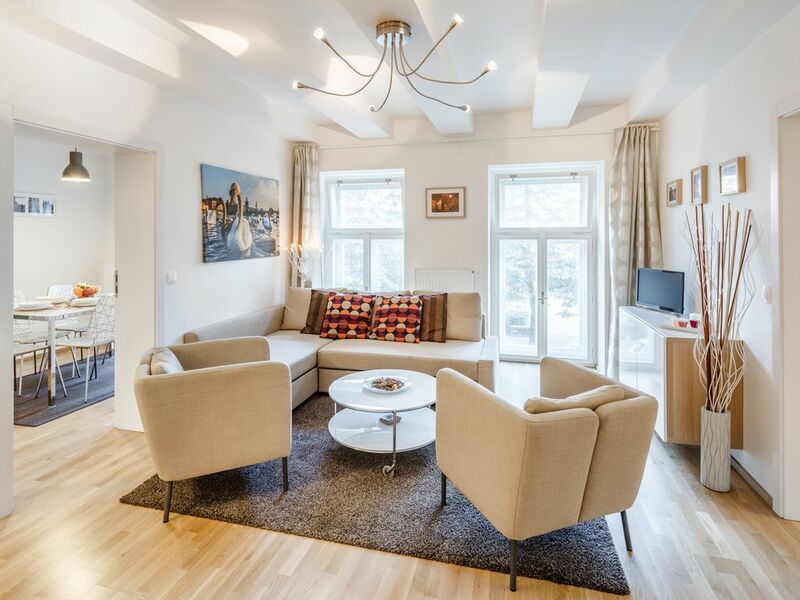 Our building "Residence Vinohrad" was completely redone in 2014 and is a jewel of Žižkovo square on the boundary of the flourishing Žižkov and the beautiful Vinohrady district. Just 20 mins on foot to Old Town or minutes away by tram or metro to all touristic sights. We absolutely loved our stay here in Prague! Robert and Pavel were so helpful and accommodating, and the apartment itself was gorgeous and clean. Easy check in and check out process. When we visit Prague in the future, we will definitely stay here again, Thanks Robert and Pavel! Fantastic situation and clean and comfortable apartment! We had a great stay at this apartment, it is situated in a calm area, near the metro and tram stations to the centre. it is clean and well equipped. Very accommodating hosts who provided a great booklet to help orient guests to the area. Easy communication with hosts who were available as needed. Great location in a neighbourhood with farmers' market and walking distance to the major sites. Appartement conforme aux photos, équipe jusque dans des détails inattendus et appréciables. Rob et Pavel ont vraiment le souci de rendre le sejour agréable et de partager leur attachement à leur ville et à leur quartier. le centre est à une vingtaine de minutes à pied. Parfait ! Die Wohnung liegt im reinen Wohngebiet Zizkov, etwas abseits der Innenstadt. Die Innenstadt ist aber mit der Straßenbahn gut zu erreichen, die Haltestelle ist ca. 200 m von der Wohnung entfernt. Die Wohnung ist sehr sauber und geschmackvoll eingerichtet. Das Bad ist ausreichend groß, die Duchkabine mit 1 x 1 m auch groß und sehr gut, warmes Wasser kommt in der Dusche sehr schnell. Die Küche hat neben einer Küchenzeile noch Platz für einen Esstisch mit 6 Stühlen, im Wohnzimmer steht eine Couchgarnitur mit 2 Sesseln. Wir waren zu zweit, das Doppelbett ist sehr bequem und 1,80 x 2 m groß. Der Vermieter (Rob) selbst war im Urlaub, Stepan hat sich gut um uns gekümmert und wertvolle Tipps gegeben, wo man sein Auto abstellen kann, wo man gut essen kann und wie man in die Innenstadt kommt.